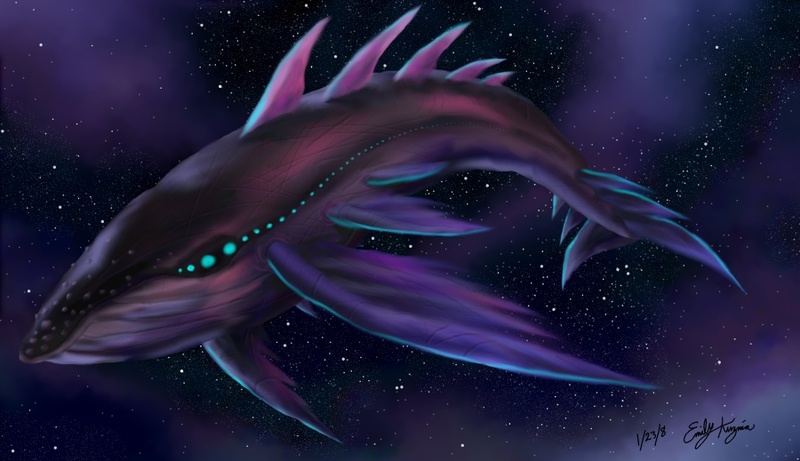 Should you foreshadow, or should the ninja space whale come as a surprise? I am currently editing (or, rather, re-editing) the revised version of my novel, The Heartland of the Winter (having managed to piece back together the work I lost in last week’s Tea-on-Laptop Disaster). One of the things I am trying to decide is how much foreshadowing to do. Some readers have suggested I should do more; some have said it’s fine as it is. Ultimately, of course, I need to go with my own judgement, although being so close to the work can make it difficult. Part of the problem is that the tale changed in the telling: for the better, but this does mean the earlier parts of the book were written with a slightly different climactic scene in mind. Ideally, what you want as a writer is that the reader will be initially surprised by the twists and turns of your plot, but will then say ‘of course, it had to be that way!’. It’s a delicate balancing act: give away too much early on and it’ll be predictable, give away too little and your revelations will come out of nowhere, leaving the reader feeling cheated. If your character uses a get-out-of-jail-free card, you need to show them picking it up earlier on – but not too obviously. As well as the general issues around foreshadowing, there are some issues which are peculiar to the fantasy genre. One is that you’re not restricted to real-world rules. Which is part of fantasy’s appeal, but can also be its downfall if you resolve your plot by just making up new bits of magic on the fly. A hallmark of well-written fantasy is that the author creates a world which has its own internal logic, so that any magical or otherwise fantastic solutions to the characters’ problems feel consistent with what has gone before. IMHO, Robin Hobb and Anne McCaffrey get it right; Naomi Novik does not. Since the fantastic elements in my story are quite downplayed, my current issue is more around character motivations, but I expect this is something I’ll have to deal with in future books. Assuming I get around to writing any. The fact that fantasy books often come in series is the source of another potential issue, namely that you need to start foreshadowing stuff which will happen not just later in the same book, but in a subsequent volume. As the gap between set-up and pay-off widens, readers may completely forget about something that happened two books and five years ago. Or you may have the opposite problem: that the fans have guessed everything in vol.3 by the time vol.2 comes out. The internet makes it very easy for fans to put their heads together and figure out what you’re up to. The author is then left with the options of either carrying on as planned, only it won’t be much of a surprise any more, or making it up as they go along. The 7th Harry Potter book suffered from this: fans had already figured out who R.A.B. was and the identity of the final Horcrux, so JKR threw in some previously-unheard of stuff about Deathly Hallows which left many feeling a bit cheated. A Song of Ice and Fire may well be headed the same way. But hey, I think this falls into the category of ‘problems I would love to have’. And then the ninja space whale killed them all. The End.